The owner of our rented beachside house in Rarotonga wanted to apologise to us. He was sorry that the weather had been so bad during our stay. But it was the wet or cyclone season, after all. Bad weather? The weather had been nigh on perfect for the week. Sure, the first day, a Sunday, had been wet. This meant it involved lazing around the house, reading, eating and drinking. But for the rest of the time, the days had been fine, if a little cloudy – perfect beach weather. Not too hot, not all that humid. And quite often when we were all tucked up in bed we would hear the rain on the roof, occasionally some thunder. By the morning the dark clouds had parted and the water, about 50 feet from our front door, was calling us. There is plenty to get up to in the Cook Islands, for the adventurous. But there are plenty of ways to enjoy your time on this tiny speck in the Pacific by doing absolutely nothing. Laze on the beach: This involves wandering about 20 or 30 feet from the front door of your beachhouse, plonking a towel on the beach in the shade of a palm or coconut tree, lying down and enjoying some down time, either snoozing, reading a book or listening to music. Splash about in the water: Rarotonga, the biggest of the Cook Islands, is surrounded by a reef, with the water surrounding the island shallow, crystal clear and full of fish … but no sharks. There is little effort needed to simply wade out a few feet and, with a snorkel and goggles, you are among colourful fish, including bright blue starfish, without glancing around every few seconds fearful of becoming sharkfood. Catch a bus around Rarotonga: There are two bus routes on the island. One travels clockwise around the island, the other anti-clockwise. No need to wonder which bus to catch or where it might go. It takes all of about 50 minutes by bus to circumnavigate the entire island. Eat, drink and be lazy: Many beachhouses have barbecues for you to cook your own meals to enjoy the seafood and vegetables on offer, or there are plenty of restaurants, many a short walk or bus ride away. 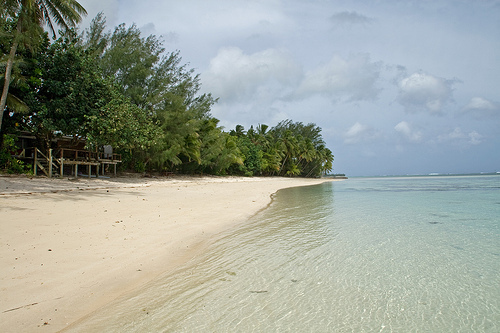 It is not that the Cook Islands is boring – it’s not. It’s a place where you can keep yourself busy with snorkling, or ocean fishing (outside the reef, fishing inside the reef is forbidden), or taking a tour of the other islands. But it is also a place that invites people to do absolutely nothing … and not be bored. The Cook Islands uses New Zealand dollars, as well as Cook Island dollars, which are worth the same as NZ dollars but can not be changed outside the islands. The Cook Islands has a two dollar coin that is triangle shaped, which is a great souvenir. The main shopping area at Rarotonga is the town of Avarua, where there are banks, supermarkets, as well as a shopping mall and cafes and restaurants. The Cook Islands are in the middle of the Pacific, northeast of New Zealand, and south of Hawaii. From Australia, there are flights on Air New Zealand and Virgin Australia. There are no flights on Sunday, following a campaign against the flights from locals. That’s understandable, because the airport is in a well populated area of the island. 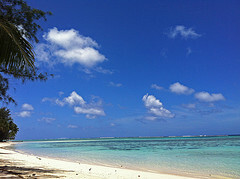 Have you been to the Cook Islands? Have you had similar experiences? Or better ones? I wold be interested in your comments. Let me know your thoughts. I took both photographs in this post. The first was taken with a Canon 40oD and a Tamron 10-22mm lens. The second was taken using an Apple iPhone 4. You can see more images on my Flickr site. Copyright of words and pictures is owned by Chris Mannolini. Please contact me if you wish to re-use any of the material. Is this the ultimate road trip scene?